Edo State police command of the Nigerian police has arrested a security guard and his gang who murdered his employer, Major Afisatu Ajuya, at the weekend. Afisatu is the elder sister to Mrs Usoh, wife of Chief Douglas E. Usoh, the Odobaewu of Benin Kingdom. The incident took place at the Upper Ugbo road area of GRA, Benin, Edo State. 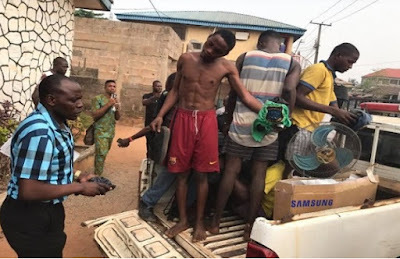 The gang who are of Hausa origin broke into the apartment and carted away with two black luggage, Samsung standing fan after setting her ablaze.